Hi. 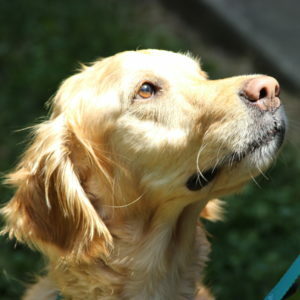 My name is Maya and I am a sweet, 5 year old golden girl. I have a lot of health issues and hope that someone will look past that and make me a part of their family. I have diabetes and need daily insulin injections which are really easy to give because I sit very still and am a very good girl. I also had cataracts and was completely blind, but As Good as Gold had a great eye doctor that took care of my cataracts and now I see great! I need drops for my eyes and am very good at letting you put them in for me. I also take pills for my thyroid since it doesn’t want to work all of the way, but that’s really easy. I am great with kids, love people and all of the attention I can get. I was used to being the only dog in my home and now am slowly getting used to being with the resident dog in my foster home. I am learning how to share people and toys. I am also great at keeping critters out of your yard. I am so fast, I even caught a squirrel! I know a lot of commands and learn things very fast. I need special treats due to my diabetes and a special diet to keep my blood sugar under control. If you are looking for a sweet girl to adopt and can give me my medications, I will be forever grateful and will make you very happy.